Prayer is the avenue we reach God through. The names and requests listed below are needs we know about and I ask you to intercede for God to answer them according to His will. Pray for Crossroads to have ever-increasing opportunities to serve our community and the willing people to do it. .......those who are addicted to drugs or alcohol. That they would have a Divine appointment with one of us out in the community and be set free and saved. 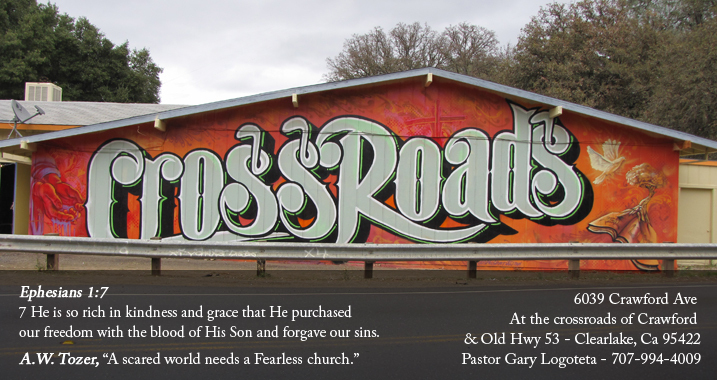 .......the people of Crossroads to be bold and courageous as they share their faith and hearts with everyone they meet. .......God's protection over us as we attack the enemies strongholds in this City and County.